Learn more about the Lorex 1080p HD Home Security System with 4 Outdoor Dome Cameras. Get pricing, and answers to common questions. 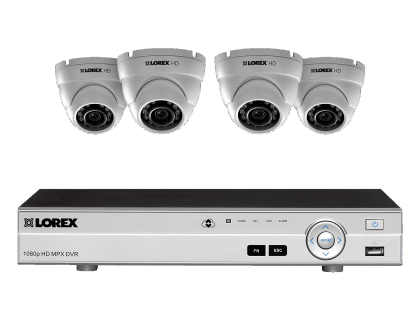 The Lorex 1080p HD Home Security System with 4 Outdoor Dome Cameras comes with an analog HD DV700 digital video recorder (DVR) and four LEV2712B 1080p security cameras. This Lorex business security system can be expanded with up to four security cameras. 4 HD 1080p dome cameras. Pros: Suitable for indoors and outdoors. Resistant to inclement weather. Cons: Customer service can be service problematic at times. Bottomline: Complete security system with crystal clear night vision, which can be expanded with more cameras as your business grows. What are somealternatives to the Lorex 1080p HD Home Security System with 4 Outdoor Dome Cameras? Where can I buy the Lorex 1080p HD Home Security System with 4 Outdoor Dome Cameras? The Lorex 1080p HD Home Security System with 4 Outdoor Dome Cameras is available via Amazon and the Lorex website. Does the Lorex 1080p HD Home Security System with 4 Outdoor Dome Cameras work at night? Yes, it has very good night vision capabilities. The Lorex 1080p HD Home Security System with 4 Outdoor Dome Cameras features cutting edge infrared (IR) LEDs, which enable crystal clear night vision. This complete security system has a night-vision range of up to 130 ft. in ambient lighting, and up to 90 ft. in total darkness. This system's ClearNight imaging assists with low light operation, and its SmartIR technology optimizes close-up recognition in the dark. Can the Lorex 1080p HD Home Security System with 4 Outdoor Dome Cameras be used in any weather? The Lorex 1080p HD Home Security System with 4 Outdoor Dome Cameras features IP66 cameras. These cameras are resilient to rain, heavy wind, and snow, and can operate in extreme temperatures as low as -22 °F.